One bright spot in this year's black hole of bad news concerning internet privacy and data security: VPNs are thriving. It seems like you can throw a rock while blindfolded and hit a crypto-technology company, many of which are just variations on the same theme. If you’re having a tough time figuring out which VPN to commit to for the rest of your web surfing days — or at least for the duration of a 90-day trial — one worth checking out is CyberGhost VPN, which is currently on sale. It does all the usual VPN duties efficiently and reliably while also introducing some truly unique and impressive features that never feel like filler. VPNs live and die by their servers; their quantity and location will dictate your connection’s reliability, browsing speeds, access to international streaming content, and other key factors. Luckily, CyberGhost is no slouch in that department. It hosts 1,300 servers in 90 locations spread across 58 different countries — from Albania to New Zealand to Vietnam — totaling over 40 gigabits per second in bandwidth. This variety is particularly helpful to world travelers, as there will almost always be a server nearby, no matter what country you’re currently exploring. Note that these numbers may fluctuate from time to time, but in the long-term, CyberGhost’s server offering will most likely continue to expand. Unlike some other VPNs, CyberGhost places zero restrictions on your browsing habits. No throttling. No data caps. You can enjoy unlimited traffic and bandwidth for the duration of your membership. And while some slowdown is to be expected when using any VPN, CyberGhost manages to stay surprisingly speedy. PC Mag’s testing found that download speeds were reduced a mere 5.3 %, and upload speeds were diminished by only 6.5%, earning CyberGhost a favorable rating from the magazine in overall performance compared to its many competitors. If speed is your primary concern when VPN shopping or you just want to be able to finish a torrent download in a hurry, CyberGhost does have a Fastest Servers option. It saves you from sifting through hundreds of locations and instead connects you to the swiftest one automatically. Where security is concerned, CyberGhost runs a tight ship, employing 256-AES bit encryption to protect your payment info from cyber-crooks and hide your browsing data from nosy ISPs. In fact, even CyberGhost itself will be in the dark about your data, as the company swears by its "no logging” policy. 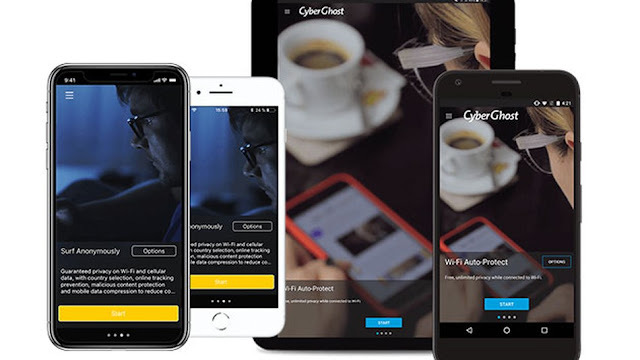 Upon launching the application, protection is immediate and comprehensive: CyberGhost launches a secure browsing session in addition to the VPN connection. And one membership extends to seven devices simultaneously, so you can be sure that every laptop, tablet, and smartphone in your tech arsenal is safe and secure. You can even set it up on your router, and lock down your network’s security at the source. Should you ever experience any sudden outages, the automatic kill switch feature protects against even the slightest bit of exposure. CyberGhost knows where its bread is buttered. It’s well aware that many of its subscribers are only on board for that sweet, unrestricted streaming. So they’ve made it refreshingly easy to do so. The application’s main UI features easily understandable options, like Torrent Anonymously, which will automatically launch your preferred torrenting client, or Unblock Streaming, which dials in specific settings for various sports channels, YouTube, Hulu, Netflix, and more. Frequently censored websites like Facebook, Google, and Twitter are all easily unlockable with CyberGhost, too, in case you’re on vacation in a country with particularly restrictive internet laws. It's CyberGhost's commitment to its users’ freedom that sets it apart from competing VPNs. Based in Bucharest, it aligns closely with Romania's high legal regard for online privacy. It touts itself as “a major supporter and promoter of civil rights, a free society, and an uncensored internet culture." In 2015, CyberGhost backed up that ambitious bio by publishing a transparency report, which detailed all the copyright complaints, attempted attacks, and law enforcement requests the company incurred that year. Normally this service is available on a monthly or yearly basis, with a lifetime’s worth of access potentially running up to $720. But thanks to a special promotion, you can get CyberGhost VPN on Mac, iOS, Windows, or Android for just $84.99 and secure your digital connections. As a special offer for Mashable readers, you can save an additional 15% off with coupon code CYBERGHOST. 0 Response to "CyberGhost is a VPN that stands out, and not just because it's on sale"